Imagine Music Festival, the regional Southeast's biggest and best electronic music festival, prepares to celebrate its 5th Anniversary with the announcement of it's the first phase of its lineup including some of the biggest and most exciting talent from around the globe. Returning to Atlanta Motor Speedway in Atlanta, Georgia on September 21 through 23, 2018, the first round of headliners for the highly-anticipated music and camping festival include: Armin Van Buuren, Alesso, Galantis, RL Grime, Zeds Dead and special guest: Adventure Club. With still more headliners to be announced, this initial collection of top tier names are joined by over 40 additional artists. 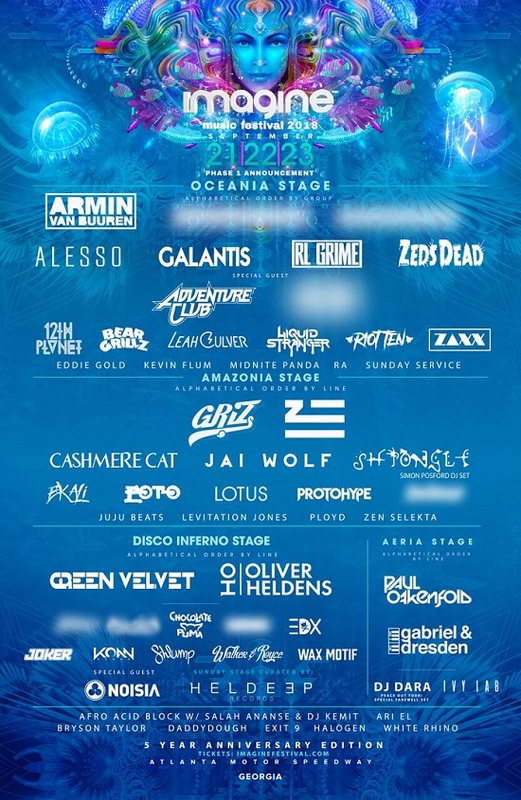 Featuring four main stages, with more stages and artists to be announced, Imagine’s immersive aquatic fairytale will permeate the grounds of Atlanta Motor Speedway – from the infield to deep into the early morning in the camping areas Additional artists on the 2018 performer lineup include 12th Planet; Bear Grillz: Liquid Stranger; GRiZ; ZHU; Cashmere Cat; Shpongle (Simon Posford DJ set); Ekali; Green Velvet; Oliver Heldens; Noisia; EDX; Joker; KOAN Sound; Walker & Royce; Wax Motif; Paul Oakenfold; Gabriel Dresden; DJ Dara; and Ivy Lab. Tickets are available now starting at $219 for a 3-day pass and $285 for a 3-day pass with camping. VIP passes with express entry into festival, exclusive viewing areas, VIP bars and lounges, and private air-conditioned VIP trailer restrooms start at $360 for a 3-day pass and $479 with a 3-day pass with camping. Several lodging packages are available, including GA Camping, VIP Camping, RV Camping, Unity Travel Qube village and Hotels. Tickets are available now, so check the links below for more information.